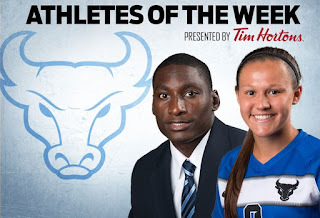 BUFFALO, N.Y. -- Sophomore midfielder Gianna Yurchak stepped up for the Bulls this week as they were without the services of their leading scorer. The Leola, PA native netted two goals on four shots on the weekend, netting goals in back-to-back games for the first time in her UB career. On Thursday, Yurchak netted the second goal of the match for the Bulls as she found a loose ball in the box and buried her second of the season. On Sunday, Yurchak netted the opening goal of the match after a nice pass from Marcy Barberic and she beat the keeper to the left corner. The goal stood as the go-ahead goal until late in the match. She tied a career-high with three goals on the season. Kevin Marks rushed for a career-high 167 yards and a touchdown in Buffalo’s 34-24 win at Central Michigan on Saturday. The redshirt-freshman running back averaged an impressive 9.3 yards on 18 carries. He had a 29-yard run to set up a touchdown on the Bulls’ first drive and then scored on a career-best 70-yard run in the third quarter. The 167 yards were the most by a UB freshman running back since 2009.